I fell in love with Fred Williams long ago in Sydney. A close friend introduced us in an art gallery. Nothing has deterred my love of Fred, not his being deceased nor my being married, What an artist! Often I think if I could just paint like Fred, or go where he went, or…. get in his head. Fred William’s use of colour to express & interpret the Australian landscape… was sublime. The textural layerings conveying the ancient beginnings of this land – exquisite. His mark making, design skills, simplicity and sensitivity in the use of his materials, knowledge and creativity has made him an Icon. He made you feel the land in his paintings. This is my interpretation of the snowfields of Perisher, Dead Horse Gap area from a series of trips to those locations some time ago. I took numerous rolls of film, jotted down copious sketch notes and of course had to go and touch the trees. Texture, is very important to me and to try to convey that sensitivity into the art image is critical. During this painting, I’ve contemplated…. Fred Williams. How he painted, his textures, his love of the land. His incredible ability to impart the feeling of the land. I’ve definitely been influenced by Fred in this piece and hope viewers are able to feel the land within it. 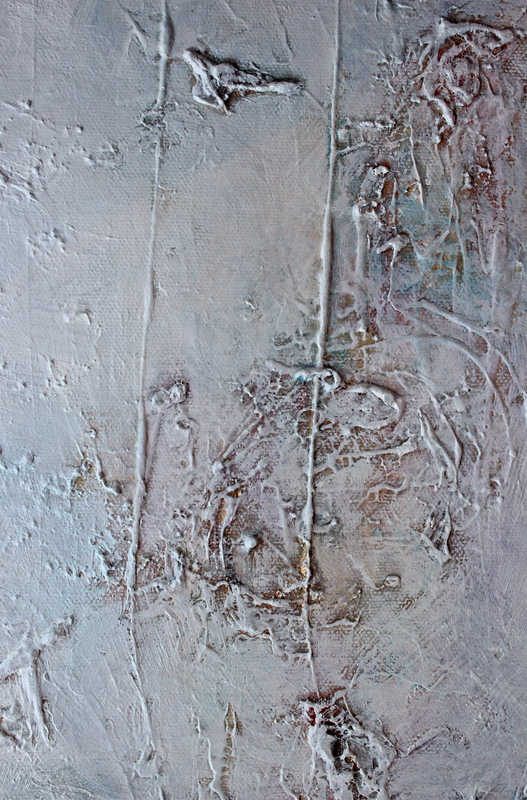 The “processes I used” were: first, I’ve textured it and layered it with gesso several times on a canvas. Laying down alternate glazes of viridian green, cobalt violet, metallic golds, cerulean blue, raw sienna and permanent rose in acrylic first. Final glazing coats of white oils mixed with rose and cerulean to finish the piece. I can see the influence of his work in this piece, very textural and full of feeling.